The Grosse Pointe Academy, a coeducation, independent day school in Grosse Pointe Farms serving students from age two to the eighth grade, has announced an expansion of its elective program through a joint $500,000 gift from the Cotton family of Grosse Pointe. According to school officials, the donation is the largest gift designated for programming to date. It will enable the school to upgrade its facilities as it moves into more experiential academic learning for its students. 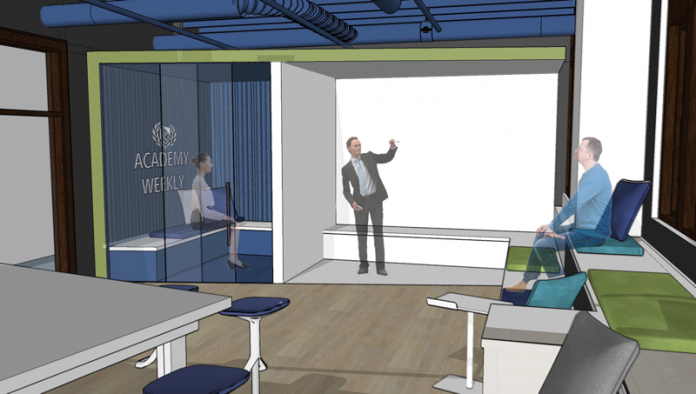 Three designated learning spaces will be redesigned to promote collaboration, problem-solving, and creative innovation to better facilitate the middle school’s new Business Explorations, Tech Ed, and Life Skills classes. The project will renovate the Center for Creative Studies, where progress is already underway. It will include dry-erase walls, flat-screen monitors, mobile work tables, advanced technology, a recording studio, and two cooking stations. The main school building’s lower quad area will be transformed into a gathering and learning space featuring a school store managed by students taking Business Explorations, flexible seating, and flat-screen monitors for class use and display. Students of all grade levels will have access to the space. The lower gym will be upgraded with fresh paint, refinished flooring, flexible seating options, a projector and screen, improved lighting, new wall padding, and wall-covering graphics.